Performance anxiety occurs whenever focus upon an uncertain outcome detracts from the process of performing. Classic examples include "freezing up" when giving a public speech or when on stage; "choking" in clutch athletic situations; and difficulties performing in sexual situations. 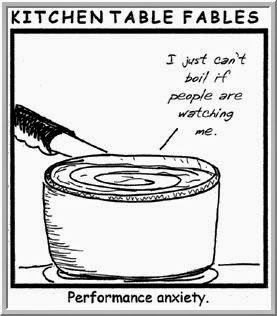 What commonly occurs in performance anxiety is that performers notice their initial anxiety and then start to become worried about it. This "secondary anxiety" sets a cycle in motion in which greater focus on anxiety leads to greater anxiety, which in turns further takes the focus away from performance. Under conditions of performance anxiety, traders will make decisions to manage their emotional states rather than to properly manage their capital. For example, in a state of performance pressure, a trader may stop out of a position prematurely, as the agony of watching profits and losses vacillate becomes too anxiety producing. Performance anxiety also rears its head in those situations where traders fail to "pull the trigger" on valid trade ideas, or where they habitually size positions too small. In no small measure, the common wisdom that traders should focus on trading process and not on profits and losses comes from the need to dampen performance pressure. Traders often take breaks from their screens in order to not become overly caught up in the ups and downs of their positions. Meditative and relaxation exercises can be particularly useful during such breaks. The most helpful techniques for managing performance anxiety are cognitive behavioral methods, particularly those that make use of exposure methods. As those who have read my books know, I have found special value in the use of biofeedback to manage anxiety in trading situations. Biofeedback simply is a strategy for using feedback about the body's level of arousal to stay calm and focused. Exposure means that you expose yourself to stressful situations via imagery and in real life. By using the biofeedback exercises to stay calm and focused while simultaneously exposing yourself to anticipated stressful situations you can literally train yourself to stay collected in the heat of battle. In situations in which people start from a high baseline of anxious arousal, sometimes these techniques will not be sufficient to dampen anxiety. Consultation with a primary care physician can be useful in those cases, as beta blockers can be used with success for dampening physiological arousal. It is not at all unusual for people in the performing arts to make use of such medication--so much so that it has become a topic of concern in professional circles. To be sure, beta blockers are prescription drugs and need to be prescribed and used thoughtfully. My experience working with people suffering from performance anxiety is that beta blockers can be very useful in extreme cases, where the anxiety is so high that it interferes with the ability to carry out behavioral exercises. I've also found it most helpful when it is used occasionally, in anticipated high stress situations, and not habitually (when it can be psychologically addicting and serve as a kind of crutch to normal performance). As I often point out, traders will commonly point to "lack of discipline" as a cause of their bad trading. Most often, there is a cause for the discipline lapses. Sometimes the causes are simply bad trading practices; sometimes the causes are underlying emotional problems; and sometimes the causes can be traced to performance pressures. In the great majority of instances, performance anxiety can be overcome with regular practice of mastery-based exercises, such as those described in the second chapter of the Daily Trading Coach book. Preparing trading plans in one frame of mind (focused, relaxed) and executing them in another (scattered, anxious) is a recipe for frustration and suboptimal outcomes.